Is it Better to Give or Receive Flowers? Today's blog topic is inspired by the findings of research that we recently came across. According to the Michael Cohen Group, who conducted research involving focus groups and surveys, 92% of women can recall the last time they received flowers whilst 97% of men can remember the last time they gifted a bouquet of flowers. These statistics might indicate that giving flowers is more of a big deal than receiving them. Either way, the percentages for both are high which suggests that those seeking an unforgettable gift would do well to go with a bouquet of fresh flowers. 89% of participants in the study reported that receiving flowers made them feel special, which is little surprise. No matter what the occasion is, there is nothing quite like a vibrant and colourful flower bouquet to really put a delighted smile on the face of that special someone.The combination of visual as well as aromatic beauty make flowers a really sensual gift that can help you express emotions which go beyond mere words. The variety of different flower bouquets available means that you can choose the perfect floral arrangement for the occasion at hand. Whether it's subtle and minimal or larger than life and expressively colourful or something in between, you are sure to be able to find a bouquet which suits your requirements. Are you looking to woo a crush with pretty romantic flowers? Sending flowers is such a memorable gesture that it will become a legend to regale the grandkids with, assuming things go well after the first date of course! Looking for a birthday gift that will really stand out from the rest? Fresh flowers will be a gift they are sure to remember fondly for a long time to come. 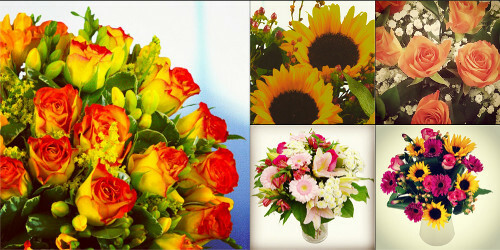 In fact, no matter what the occasion is, flowers will always be an unforgettable gesture!